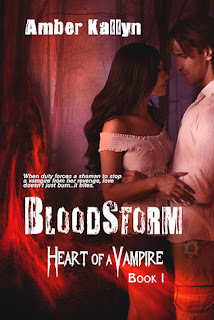 Blurb: When duty forces a shaman to stop a vampire from her revenge, love doesn’t just burn... it bites. Someone shouted and air rushed through the trees, knocking her backwards. A snaking vine tangled her feet. It crept up her legs and yanked them together. Niki hacked at it with her daggers and it disintegrated. The man from the bar stood between her and the other two vampires. She met his gaze, and once more nearly stumbled as the intensity of sensations weakened her knees. He waved his hands in weird, symbol-like gestures. Must be a mage. On the other side of him, the vamps were clawing at their own vines. They managed to get free, only to send her heated glares which promised retribution before they melded into the shadows. The leaves rustled and Niki found herself in the center of a leafy cocoon, branches and vines holding her in. “Too bad your kind can’t shift like in the myths. I bet a bat could get out of there, but not much else. Certainly not you.” Anger tinged his voice, harsh and unbending. She inched her long dagger up, slicing through the cage. The branches fell open and she stepped out. His eyes glowed golden. As she stared at him, time seemed to slow, just as it had in the bar. Chocolate colored hair flowed down his back. It was loose, but for a small braid at his left temple. It framed a face carved from granite--high, prominent cheekbones, straight, almost hawkish nose, square chin. The only softness in his face came from the gold eyes and wide lips. Something inside her warmed. Blinking, she tried to ignore these strange sensations. She hadn’t felt like this in centuries. This man shouldn’t be able to affect her, not like this. Mage. Yes. But that didn’t explain it. She didn’t understand what was going on, but she couldn’t--wouldn’t--let such a feminine response to this guy get in her way. Leaves crunched and a twig snapped, the crack echoing in the silence. A uniformed cop stumbled from the trees, tripping over an exposed root. “Sheriff?” he called to the man staring at her. The sheriff turned. As their eye-contact broke, energy moved through her once more. She didn’t look back as she raced into the forest, hidden by shadows. Behind her, the man cursed. Niki soon left them far behind. She relished the freedom of running through the trees at night, but there were more important things to focus on. Like catching up with the snitch and his partner, and finding out where Thomas was hiding. Then, she could kill the man who’d destroyed every ounce of peace and happiness she’d ever known. The man who had made her into the monster she was now. Amber is giving away a $5 Amazon gift certificate to one lucky winner at this (and every) stop in the blog tour. Just comment below to be entered. Amber will also be giving away a $20 Amazon gift certificate to the wonderful host who has the most comments at the end of her tour. And she will be giving away another $20 Amazon gift certificate to the reader who leaves the most comments on all the blogs she’ll be visiting. (If there is a tie, she will use Random.org to select the winner). I can't wait to read this one! Thanks for hosting. Gorgeous cover, Amber and huge congrats on such a great book! Can't wait to read it! I agree with jamigray it is a beautiful cover. I agree, it's a very nice cover. Are the characters like the people in the pic?? We agree, what a striking cover! Thank you, Amber! And thanks to everyone for commenting. Loved the teaser - I must say I will never tire of vampire novels !! Will be adding this to my tbr pile ;) to def check out ! thanks for the giveaway ! Looks great. I would love to read this! I am like everyone else and in love with the cover. And the excerpt has me pulled in! Can't wait to read it. And the winner of the $5 Amazon gift card is Daniela. You should have an email from me. Thanks so much for having me over.